When Tae Kim bought his first 3-D printer nearly 10 years ago for $400,000, he was well ahead of the curve. “Back then, 3-D printing was absolutely unknown,” said Kim, an associate professor of clinical dentistry at the Herman Ostrow School of Dentistry of USC. 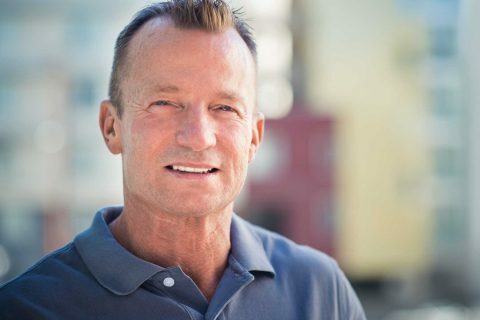 Since then, Kim has dedicated his research to creating 3-D partial and complete dentures, which are more precise, comfortable and faster to make than traditional dentures. In addition, if a patient loses their dentures, Kim can access their digital file to reprint a replacement in a matter of days. 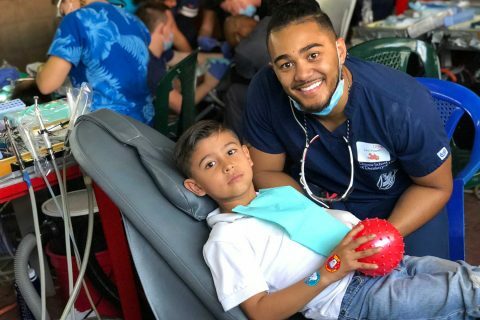 As the driving force behind last year’s introduction of 3-D printing into the school’s curriculum, Kim is excited to teach the next generation of dentists the new technology, which he believes will become a standard within the next decade as 3-D printers increase in quality and affordability. Starting in their second year, dental students at USC learn how to use 3-D printers to make partial and complete dentures. The move has not only positioned their school as the first dental school to incorporate 3-D technology into its curriculum on a mass scale, but it has also sparked student interest toward prosthodontics in a way Kim has never seen before. Born and raised in South Korea, Kim completed his dental undergraduate studies at Seoul University in 1997. 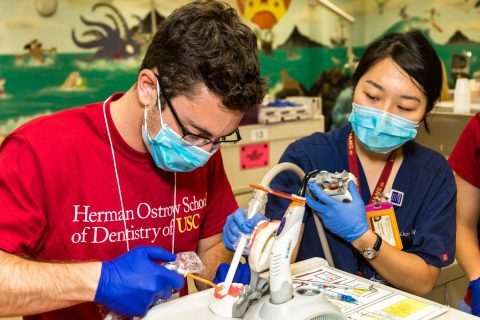 When the time came to choose a postgraduate training program, Kim chose USC because of its long-standing reputation among dental programs. Once at USC, Kim’s mentor and good friend, Bernard Levin, encouraged him to consider specializing in prosthodontics. Levin wrote the definitive text on complete denture impression and initiated an advanced certificate program in prosthodontics at USC in 1966. I realized I could make a brand-new smile for people who don’t have one. I think that is what is fascinating to me. Kim quickly became interested in how emerging technologies, such as 3-D printing, could be developed in relation to prosthodontics. “It is the perfect industrial technology to make any customization because you are only making one thing at a time,’” Kim said of 3-D printing. Upon graduating from the Ostrow School in 2001, Kim’s decision to join the school’s faculty was an easy one. Kim especially enjoys hearing back from his students who have gone on to further their training at postgraduate programs around the world, including the U.S. Navy. Very often, Kim said, students don’t realize how advanced their dental training was until they find themselves helping and teaching their more experienced colleagues. Looking to the future, Kim hopes to contribute to USC’s highly regarded worldwide reputation through his teaching and research of 3-D prosthodontics. “I’d like to continue that tradition so that we could lead this field of removable prosthodontics and teach other schools and dentists, so that eventually, it will benefit all patients who need that service,” he said. Two clinics offer free, life-changing services to Los Angeles’ underserved population. More than 5,000 veterans have received help since the annual Veterans Smile Day event began three years ago.